Featured Links - our personal favorites. Complete Links List- add a link to your site or to your favorite sites; or browse the sites that we've compiled with the help of our visitors. Finch Articles Library - a list of links to finch articles on the internet, indexed by topic. The following is a list of our favorite websites. We find them extremely useful and visit on a regular basis. These links are a good starting point to finding finch information on the web. For a more complete list of links, visit our Complete Links List. The Complete Links List is more comprehensive and includes links suggested to us by our visitors. You can also get your sites added to that page. Or, if you are looking for a specific topic, be sure to visit the Finch Articles Library, where we've indexed by topic over 1000 bird-related articles published on the net. The National Finch And Softbill Society (NFSS) website - The NFSS is a great source of information. If you become a member, you will receive a newsletter every two months with informative articles and bird show/fair/seminar listings. Members who wish to breed can also purchase bands for their birds. Finchworld - Contains information and links on many different finch species, care and housing, health information, and a state-indexed breeders list. But in my opinion, the most valuable asset of this site is its Finch Forum. I have the capability of offering a message board on this site, but declined because there already is a fine forum with a very knowledgeable and loyal following at Finchworld. eFinch - Many sections of this site are not completed yet. However, the "Varieties" section contains some good information, including an extensive collection of photographs of the mouth markings of hatchlings of various finch species and mutations. The Finch Self-Medication Website - Scientists have seen birds and animals use plants, soil, insects, fungi as 'medicines.' This website lists articles that explain findings on this remarkable ability. Salem's Java Finch Pages - This is an excellent site focusing on the Java Rice Finch with tons of information and wonderful pictures. If you're not interested in Javas, don't let that dissuade you from visiting. Much of the information here applies to other finch species as well. This is a site you don't want to miss. 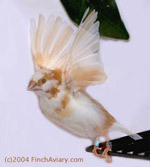 Feathered Flyer - A site covering all types of pet birds, with very good information and original articles on finches. The Finch Niche (Formerly Seffera.net Birds) - This is the personal site of a finch breeder. The Finch Articles section contains a lot of good information on a variety of topics. The Finch Information Center - Another well-organized and very thorough finch site containing useful information on all aspects of finch keeping. Birds'n'Ways - Although this site is not finch specific, it is a very good pet bird resource, complete with an online magazine (e-zine) Winged Wisdom. This site also contains a fairly comprehensive list of bird shows and fairs. Exotic Finches - This site contains detailed information about Society finch genetics and mutations, complete with pictures. Lady Gouldian Finch - Site managed by a Gouldian finch breeder. Contains great information about care of Lady Gouldian finches. Hot Spot for Birds - This is another general-purpose bird site. If you want to add plants to your aviary, this site contains lists of safe and toxic plants, as well as a list of toxic fumes. My Gouldian Aviary - A site about an outdoor Gouldian aviary in Australia. African Waxbills - A site dedicated primarily to African Waxbills, but with information about other species as well. Lots of neat pictures. The Queesland Finch Society Inc - An Australian Society dedicated to finches; the site contains some good articles. S. N. Aviaries - A website devoted to the Java Rice Finch with some excellent articles pertaining to this species. LadyGouldianFinch.com - Sells a variety of maintenance and breeding supplies as well as medications and supplements. Also a good source for finch information. The Finch Niche - Sells a variety of maintenance and breeding supplies as well as medications and supplements. Again, another good source for finch information. All Bird Products - Seller of a variety of bird supplies. Just Bird Stuff - Seller of a variety of bird supplies. Beaks 'n Bills - Distributor of Abba bird products. Herman Brothers Seed - Sells a wide variety of seed and seed mixes. Prices are reasonable compared with commercial seed and very fresh. We buy the E&M finch mix for our birds. National Bird Designs, Inc. (Avi-Culture) - Sells the Avi-Culture brand probiotic that can be added to eggfood. I use this product three times a week in the eggfood to prevent Candida (yeast) infections, and to date, I haven't had any new incidences of Candida in my aviary. Foys Pigeon Supplies - Pigeon Supply Store selling a variety of medications that can be useful in finches as well. Jedds Pigeon Supplies - Pigeon Supply Store selling a variety of medications that can be useful in finches as well. Finch Forum - One of the best places to turn when you need advice from people who have been there. No book or web page is going to provide you with everything you will want to know. Sometimes you just can't beat experience. Even if you don't have any questions, its a great place to lurk to see how others resolve their problems (someday their problems may be your problems too). Niles Animal Hospital and Bird Medical Center - This is the website for the veterinary center that I use. I've listed their site because it contains some nice articles about bird care. Note: last I checked, it appeared that Niles AH has changed hosting services and is in the process of bringing their site back on line. I've left the link here in the hope that it will eventually come back up. If it does not, I will remove this link from this page. Association of Avian Veterinarians - This site contains an avian vet locator for finding a vet near you. Baby Bird Avian Directory - Follow their Directory Listings link to get to a directory of avian veterinarians. Note this site also contains directories of bird breeder, bird supply sources, bird-friendly pet stores, and pet rescues.